1000 Red TamperColor Tamper Evident Security Label Seal Sticker, Rectangle 2.75" x 1" (70mm x 25mm). Custom Print. >Click on item details to customize it. A versatile, reliable performance and durable polyester security blue 2.75" x 1" sticker that detects tampering with objects containing valuables, confidential information, or calibration equipment. The tamper indicating provide a "VOID" message in the surface when removal is attempted; you'll instantly know if someone peeled this security seal off. 250 Blue TamperColor Tamper Evident Security Label Seal Sticker, Rectangle 0.75" x 0.25" (19mm x 6mm).Custom Print. >Click on item details to customize it. 500 Red TamperColor Tamper Evident Security Label Seal Sticker, Rectangle 2.75" x 1" (70mm x 25mm). Custom Print. >Click on item details to customize it. 5000 Grey TamperColor Tamper Evident Security Label Seal Sticker, Rectangle 2.75" x 1" (70mm x 25mm). Custom Print. >Click on item details to customize it. 5000 Blue TamperColor Tamper Evident Security Label Seal Sticker, Rectangle 1" x 0.5" (25mm x 13mm). Custom Print. >Click on item details to customize it. 2000 Red TamperColor Tamper Evident Security Label Seal Sticker, Rectangle 2.75" x 1" (70mm x 25mm). Custom Print. >Click on item details to customize it. 2000 Red TamperColor Tamper Evident Security Label Seal Sticker, Rectangle 0.75" x 0.25" (19mm x 6mm).Custom Print. >Click on item details to customize it. 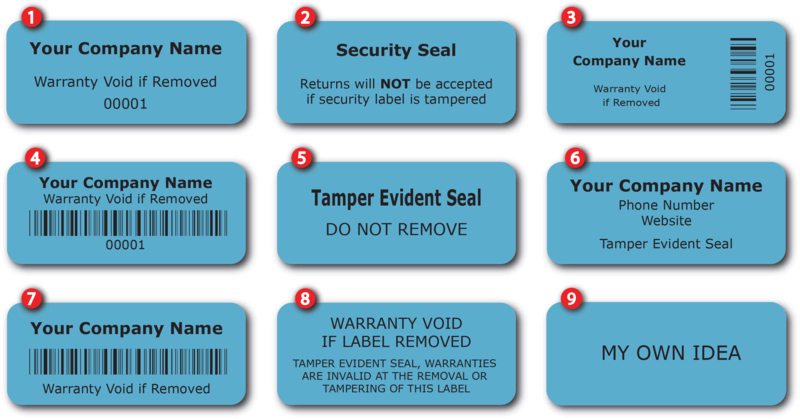 1000 Blue TamperColor Tamper Evident Security Label Seal Sticker, Rectangle 0.75" x 0.25" (19mm x 6mm).Custom Print. >Click on item details to customize it. 2000 Blue TamperColor Tamper Evident Security Label Seal Sticker, Rectangle 2.75" x 1" (70mm x 25mm). Custom Print. >Click on item details to customize it.